ANG mga PEACE advocates dinhi sa lalawigan midason sa baroganan ni Bishop Leonardo Medroso aron babagan ang pagsulod sa small town lottery (STL). 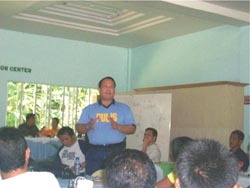 Atol sa gipahigayon nga Provincial Peace and Order Council meeting human sa usa ka civic action didto sa Danao, Bohol, ang mga sakop sa konseho mipasar og usa ka resolusyon nga nag-awhag sa Provincial Board ug sa liga sa mga mayor nga dili gayod tugutan ang STL. Si Danao Mayor Thomas Louis Gonzaga mipasabot ngadto sa konseho nga ang mga STL operators nangayo og pakitabang sa Sangguniang Panlalawigan ug ingon man sa League of Municipalities of the Philippines (LMP) aron mohatag og pagtugot nga makasulod ang laing matang sa sugal dinhi sa lalawigan. Matod niya, ang usa ka endorsement gikan sa Provincial Board o LMP igo nang magpatagbaw sa mga kinihanglan aron ang mga gambling operators kahatagan og katungod nga mopahigayon og gambling operations dinhi. Kon tugutan nga maka-operate dinhi, ang STL makamugna og bag-ong matang sa sugal, diin ang publiko nga motaya adunay kapili-an. Ang mga law enforcers ug political leaders sa Bohol wala kaayo molampos sa ilang kampanya batok sa ilegal swertres, illegal cockfights ug mga dinagkong sugal sa baraha diha sa kabarangayan. Ang ubang mga mayor nagkanayon usab nga ang pagsulod sa STL makapawagtang sa ilegal nga sugal ug mokita ang lungsod pinaagi sa bahin sa maong operasyon. Ang mga STL operators nagkanayon nga ang pagsulod sa STL makapatay gayod sa kasamtangang ilegal nga sugal. Si Medroso, kinsa mibiyahe og sobra sa 70 kilometro gikan sa Dakbayan sa Tagbilaran aron pagtambong sa tigum sa konseho didto sa Barangay Magtangtang mipadayag sa pagka yawan-on sa sugal. Ang Obispo mipagawas na og pamahayag nga nagsupak sa pagsulod sa STL samtang nagkanayon nga ang sugal adunay gahom nga mawad-an og kusog ang moralidad sa katawhan. Sa kahadlok nga ang Sangguniang Panlalawigan ug ang mga mayor mohatag sa gikinahanglan nga pagtugot, si PSSUPT. Edgardo Ingking misugyot og resolusyon nga nag-awhag sa duha sa legislative bodies nga dili gayod mohatag og endorsement. DANAO - If you think only on online games can you go level up, take another look. Here however, level up is not on those multi-tiered internet on-line games. Far from the thrill of getting absorbed in the perpetual dusk of internet cafes and the muted click of computer keypads is a world for the taking; wild, needing control and truly exhilarating. This is the new kind of level up Danao offers. Level up here is not on keypads or smooth shifting toggles. Level up here definitely needs more than that. Tie shoelaces a bit tight. You would need it to get as comfy as if you are barefoot. Why? Because level up here is root-climbing, cliff-scaling, rock wall climbing, simply bouldering, kayaking, river trekking or zip-lining. Your pick. A 60 feet high limestone cliff with a face brittle in summer yet soggy wet with humidity and forest moisture on most times of year. You’ll have a safety harness, because a slip might just get you plunging to the gurgling waters of the Wahig. That is for amateurs. For professionals, skipping the safety harness routine is a dare. Before that root climbing routine, wade in hip deep or shoulder high river. Your local guide would caution you to follow his steps though. The relatively simple part is slipping on the safety harness. Then, harder, you clamber up the intricate weave of roots, your sneakers dripping wet, and toe-holds are tricky. The hardest: make sure you’ll have three contact points at all times: two feet and one hand or two hands and a feet. Hands over the head. Tight grip. Tug on to the root making sure it wont give way when your full load is on it. The plan is simple. Climb up the cliff; that’s 60 foot climb using the entangling of roots from that formidable family of ficus (balite). Note, this is root climbing, not swimming, so keep the focus and don’t ever let go. Before the adrenaline could settle down from that mad clamber, now you go down the other way, by ropes. The same three contact points get used as you snap yourself on to a lifeline on your rappel down. From an overhanging branch where the lines are hitched, grab the line with your left hand, and your right holds on to the other line near your butts, to effectively control your rate of descent. As you hang suspended from that overhang, dangle, allow the wind to calm you down, and then in one heave, slowly loosen your grips, simultaneously kicking off the cliff face when the pendulum gets you there. 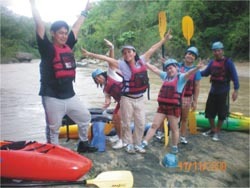 Danao also offers shooting the rapids with plastic and colorful kayaks. But you need to put on life vests and hard hats. Currents along Wahig River can be tricky and you may need to navigate through massive boulders so a head-gear is in order; for your safety. For the less adventurous, taking the rubber tubes is the thing for you. The ride is about five minutes long or if the water is alright, you can take a longer one, from the upper tributary before the bridge. 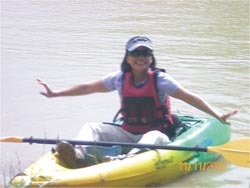 Oh, yes, the trip is smooth, unlike the one that would tire you out when you go river trekking. The scenery is breathtaking, and the experience is definitely worth more than a page in your diaries. 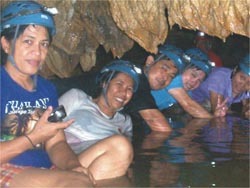 Danao caves also have exactly the lure adventurous people would die for. Ka Mira, a cave beneath the tourist accommodation center takes you to into a 500-meter walk, wade and crawl. Get into the historic caves that have become the favorite hiding places of local revolutionaries and retrace their escape routes under noses of pursuing Spanish guardia civiles. The caves still sport health stalactites and stalagmites, the stone formations are astonishingly perfect and the water that runs through the caves are crystal clear. If you get lucky, you may spot albino crabs, local cave tour guide would tell you. Careful though that you do not get into the cave on rainy seasons, the water can rise and you could get trapped for hours. The water marks at the side of the caves can tell that the waster can fills some small passages, especially the portions when you would have to crawl to get through. You can wedge yourself however in vertical crevices, but you must have the expensive Petzl head gear and the equally costly Black diamond halogen headlamps. The items however are standard issues for tourists. 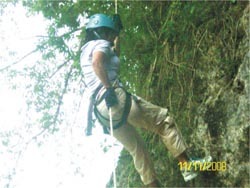 Extreme experience in Danao also gets on a different kind of high. A zipline which you need to experience if you are that sure about getting a kick is definitely the thing to do. The line is stretched across Wahig river. It is not as long and scary as the one that would be available next month, but people with less bladder control may have to let go. I mean, adult diapers are needed. The primary goat is to traverse the river while you are suspended on safety harness as you feel the air wheezing in your face when you slide to the other end. Next month, if they hit it without a snitch, one of the country’s longest zipline would be available. One of the longest means 550 meters spanned across the cliffs of Danao. You would have to go the way in too, if you have successfully taken the way out. That would be 1,100 meters of slide. But that is not mean. What is mean is that you would have to slide and when you are off the ground, you would be suspended at least a thousand meters above the forests, rivers and caves of historic Danao. 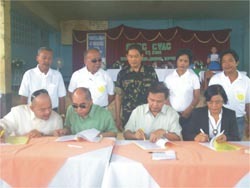 DANAO - Aggressive efforts by Danao top officials have finally paid off. This year, much of the local government initiated Extreme Eco-educational Adventure Tour (EAT) here gets its much needed boost when the country’s tourism department Danao as an opener for its five minute 2008 tourism promotions video for Bohol. The video production, DOT’s 2008 brainchild project opens with a scene reminiscent of Chinese mist covered mountains, but the shots are unmistakably Danao. 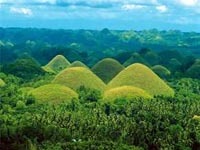 “This is something new for Bohol, which is always associated with the Chocolate Hills, tarsier and the beaches. And the way the local officials are doing it, we are confident that Danao can handle this new brand of adventure activities,” local videographer and concept designer Ted Ramasola revealed. 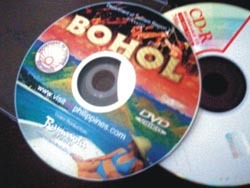 According to him, the five minute Bohol video was a standard item in the give-away package during the recent United Nation’s World Tourism Organization side-trip to Bohol. 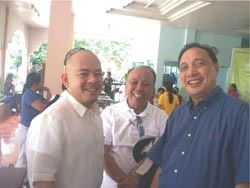 NWTO had a convention in nearby Cebu and took the technical tour in Bohol two months ago. “We are very excited that our efforts have finally been recognized and we consider this as our first step in an attempt to sell a different niche in tourism adventure,” mayor Thomas Louis Gonzaga said in an interview. The adventure tour, apart from an overdose of local history and pristine environment, is also a venue for learning about the life in the outdoors in an authentic experience. Danao and its extensive network of caves, thick forests, seemingly insurmountable limestone cliffs and fording creeks and river was host to the country’s longest revolt led by the legendary Francisco Dagohoy. Part of the heroic tales narrate that after successful offensives against the Spaniards during the 17th century, Boholano warriors would take the Danao topographic advantage to easily slip away from the pursuing soldiers. 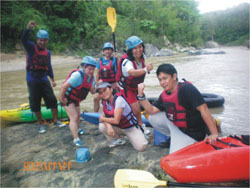 Tour Danao attempts to take tourists into similar experience of getting lost to nature in a wide array of activities like river trekking, kayaking, bouldering, rock wall and root climbing, a soon to open 550 meters tyrolean traverse and a hundred meter rappel. Kolektor sa Taytay sa Kauswagan Inc. gitulis ug gipusil kaniadtong Abril 21, alas 5:00 sa hapon didto sa barangay Taming, Danao ning lalawigan. Ang biktima gipaila sa Danao PNP nga usa ka Alger Nguho, 25, minyo ug taga barangay Buacao, lungsod sa Clarin. Samtang nagsakay ang biktima sa iyang motor dala ang iyang salaping cash nga gikolekta gikan sa ilang mga kleyente, pag-abot niya sa awa-aw nga dapit, tulo ka tawo ang miatang kaniya nga nagtap-tap og puting t-shirt sa ilang mga nawong ug midiklara nga tulis. Misulay sa pag-ikyas ang biktima apan usa sa mga tulisan ang mipusil kaniya ginamit ang mubong armas. Nakuha gikan sa biktima ang iyang bag nga gisudlan sa kwarta nga mokabat ngadto sa 12,000 ka pesos. Ang mga tulisan yano lamang misibat gikan sa maong hitabo. Gumikan sa panabang sa barangay kapitan sa maong dapit gidala ang biktima sa tambalanan. Samtang padayon pa ang kapolisan sa pagpangita sa mga tulisan niini karong panahona.